Independant Senior Housing	Affordable housing for older adults. Providing attractive, convenient apartments at a cost every older person can afford. Building & Grounds	Colonial View Apartments are for people who are over 62 years of age and are able to live independently. 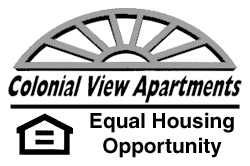 Colonial View is dedicated to providing affordable, clean, attractive and safe housing for low income older adults and mobility impaired. Amenities	Colonial View Amenities There are many day to day needs that Colonial View provides on-site. Whether it is groceries, transportation, social activities or just to relax and have an ice cream cone or cup of coffee Colonial View has great amenities for its residents. Welcome to our website. At Colonial View, we strive to provide quality living in a comfortable environment where older adults can thrive and enjoy life. Colonial View is far more than bricks and walls. It is home for people who enjoy their independence, with neighbors who care. Thank you for visiting our website and enjoy the tour!